When Kitchen PLAY asked me to participate in the “30 Days of Outdoor Dining” event sponsored by Land O'Lakes I knew what I wanted to prepare before I finished saying yes. Then the grueling days went by and the excitement turned to anxiety as I waited for my coupon to purchase my cheese until the day I opened my mail box, and there was the envelope. Now to get the cheese. Shopping to me is half the fun of cooking. The cheese was easy to find and it's available at the service deli section at a wide variety of grocery stores and independent delis. 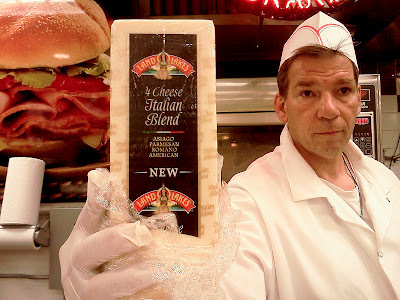 Dave the deli man was more than happy to slice it as thin or as thick as I wanted, offering me tastes as we went - he even asked me if I wanted him to separate it into quarter pound portions -great guy- and he gave me permission to post his picture, I can't wait for him to see this. I picked a few things from the garden. Summer is the perfect time to make great healthy dishes, and having a garden makes it even easier. 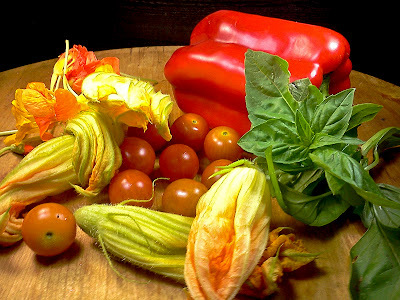 Squash blossoms, cherry tomatoes, basil, and a red pepper will come together nicely with my Land O Lakes® 4 Cheese Italian Blend and will make my little addition to the picnic have some color and flair. My plan was to make an olive oil and blanched basil slurry then incorporate this into a creamy alfredo sauce with the cheese resulting in a basil pesto alfredo. 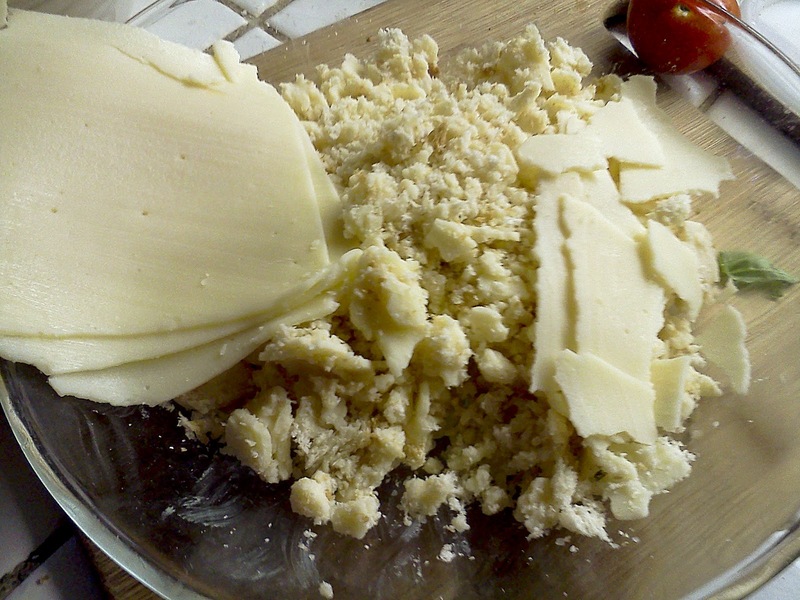 I first put in some flour and a knob of butter and stirred until my roux was a perfect golden blond. 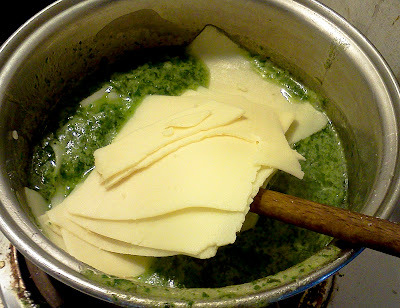 I then poured in my basil slurry and some water and about a quarter pound of this delicious cheese As it thickened I continued to thin it with water until it was the consistency I was looking for: not too thin, not too thick. I tasted for salt and pepper, decided it needed pepper and this sauce was done. I charred the red pepper, peeled it, put it in the blender with some garlic and a little water until it was smooth. Then I warmed it up with a tablespoon of tomato paste to kick up the color, and this sauce was done. 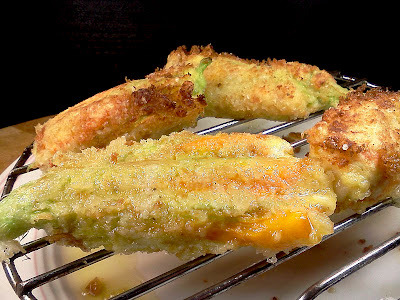 The next step was to stuff the squash blossoms with a little bread crumb and some of the 4 Cheese Italian Blend and an egg to bind it all together. Once they were stuffed they were rolled in flour then egg then bread crumbs and shallow fried until crispy and golden. Now pack the blossoms in a Ziploc bag and your cut tomatoes and basil in small sandwich bags, put your two sauces in squeeze bottles and you are ready for your kicked up picnic. I plated this dish up by first squirting a little of the alfredo sauce in the center, then I drizzled a little of the red pepper sauce around the edge. 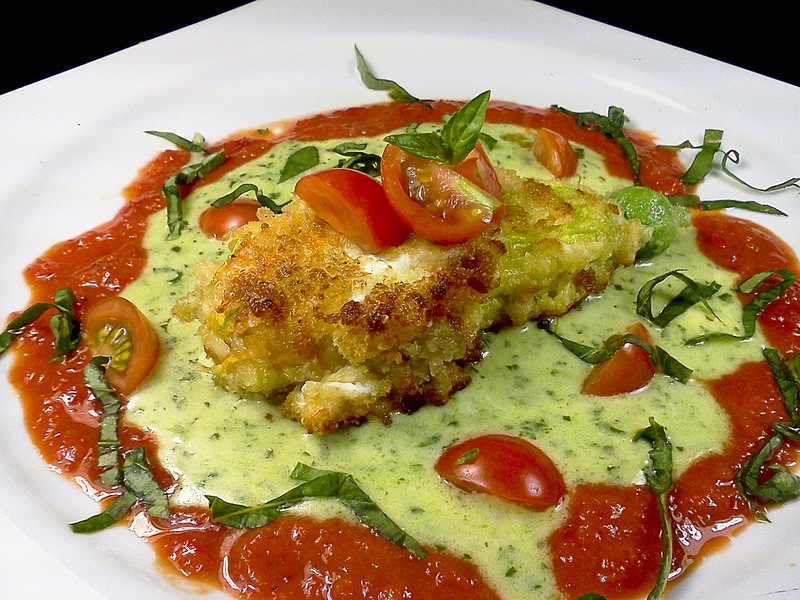 I placed the stuffed and fried blossom in the center of the sauces and garnished it with a little of my shredded basil and some sliced cherry tomatoes. This is most definitely the tastiest and cheesiest stuffed blossom I have ever had. 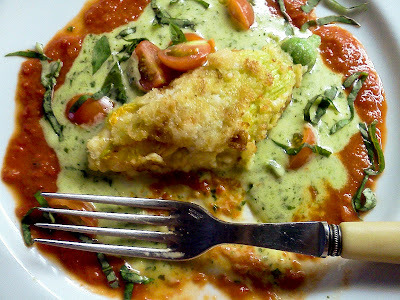 The combination of the cheesy basil alfredo and the sweet spiciness of the red peppers balanced so nicely with the fried and crunchy goodness of the squash blossom with its ooey gooey cheese center. 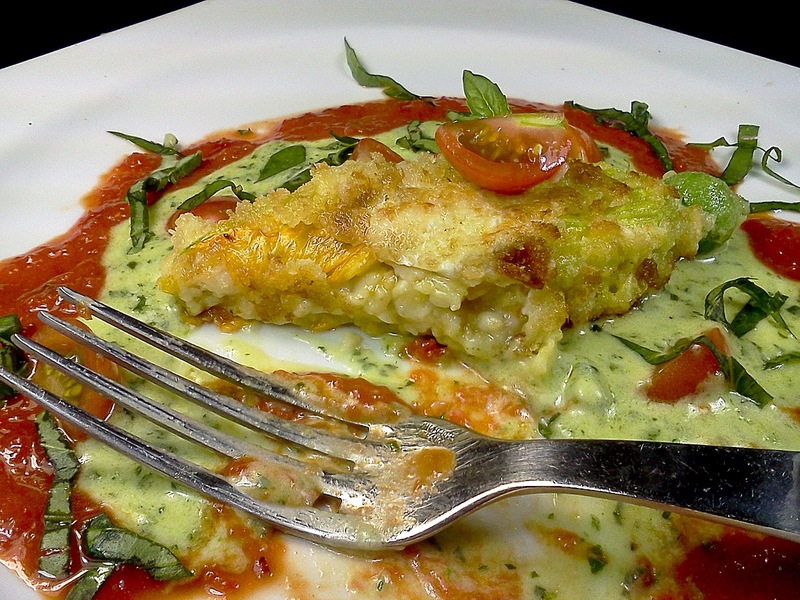 This is, without a doubt, a cheese lover's delight that is good warm and at room temperature. So pack this in your next picnic and have it on your deck, balcony, roof top or little patch of grass. You will not be disappointed and neither will your guests. Oh and it goes great with an ice cold pilsner or a crispy cold pinot gris. Blanch the basil leaves in salted boiling water for 5 seconds then shock in and ice cold water bath. 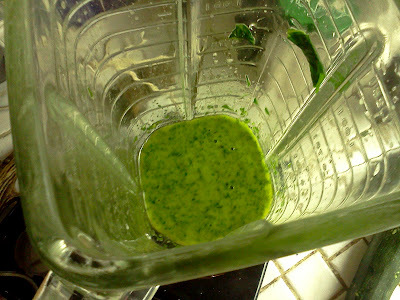 Put basil in a blender with the olive oil and puree until smooth. Make a roux with the 2T flour and the 2T butter, when roux turns a nice golden color add the basil slurry stirring constantly and drizzle in some cold water to maintain consistency, when it looks like the roux is at its thickest add half the cheese and more water until it is a smooth sauce that sticks to the back of the spoon. Char the peppers over a hot flame, when charred on all sides place in a plastic bag to sweat. Once the peppers are cool, peel the charred skin, discard the seeds and place the peeled peppers in a blender with the garlic and a little water, blend until smooth. 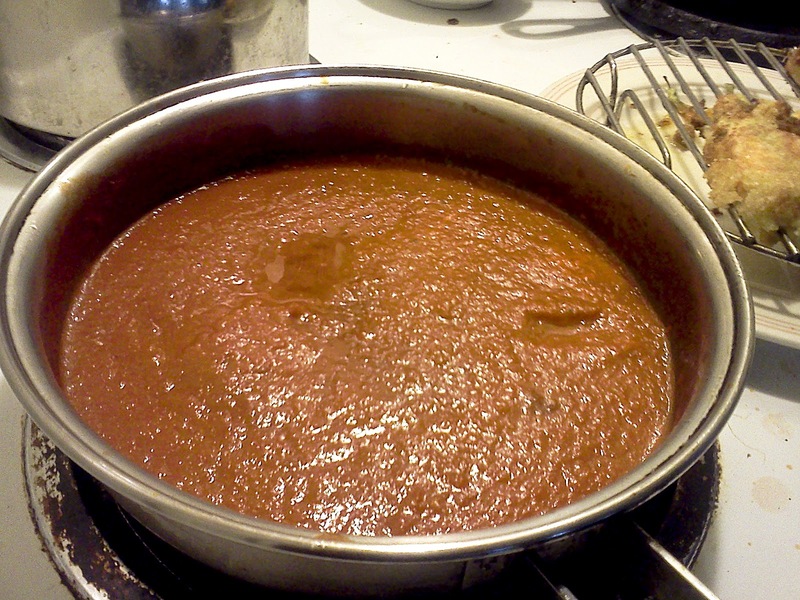 Transfer the red pepper sauce to a small saucepan and add the tomato paste, stir to warm and taste for seasoning. Take the remaining quarter pound of cheese and mix it with the bread crumbs, add a pinch of salt and pepper and the egg. This is the filling for the squash blossoms. Take a blossom in one hand and gently split it open on one side so you have a flap, put in about a tablespoon or two of the filling until the blossom looks full and plump then wrap the petals back around to make a cylinder. Repeat with remaining blossoms. 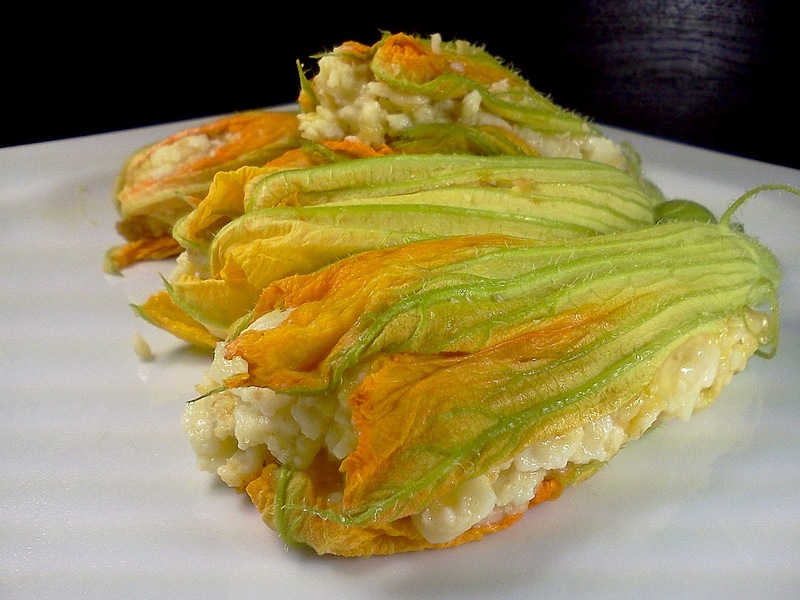 Dredge the stuffed blossoms in flour then in egg then in the bread crumbs and fry in a pan with the 1/4 cup of oil until golden, drain on paper towels or a rack. When ready to serve put some of the basil alfredo sauce on the plate and circle it with the red pepper sauce, put the blossom in the middle of the sauces and garnish with sliced cherry tomato and shredded basil. *Disclosure: This post was sponsored by Land O’Lakes as part of the Kitchen PLAY SideCar series. The views and opinions are my own and are given without prejudice.